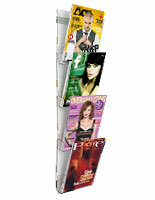 Check out all of the Wall Mounted Magazine Racks we Carry. Many Size Options to Choose From! 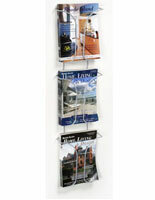 This Triple Pocket wall mounted magazine rack is the perfect addition to any business. 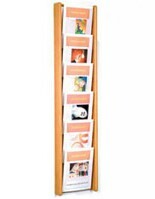 This is designed to hold your magazines upright so the top corners don't fold over the pocket front, this keeps them looking newer for longer. 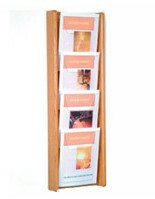 The back and sides of the rack are constructed of oak wood and are finished in a light oak stain. 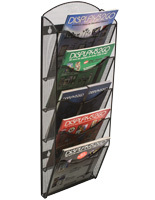 The front of this literature display, magazine rack is made from clear acrylic. This is designed in a "waterfall" style, the 3 pockets are tiered one on top of each other. This gives you full visibility on the bottom pocket, and 8" unobstructed on the top 2 pockets. 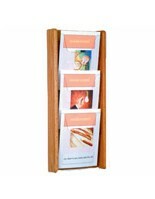 The pockets are 9 1/2" wide x 11 3/4" high, ideal for your standard 8 1/2" x 11" magazines and literature. The acrylic front panels are 10.5" high 9.5" wide, with a 7.5" high dip in the middle. 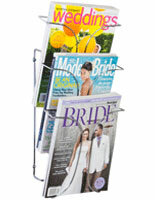 Included with this magazine rack is the hardware needed to mount this to the wall. 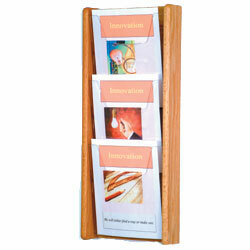 This style magazine rack is highly recommended for doctor offices or businesses with a waiting room or lobby. 11.0" x 26.3" x 3.0"